Mindsparkle Mag provides you with a full 360° set of visibility to engage with your desired audience through all of Mindsparkle Mags channels. Give your designs full attention and grow your following and raise brand awareness. Make us your ambassador. Publish your content on Mindsparkle Mag blog to reach thousands of readers. We guarantee to feature & promote (up to 4) of your projects per month. Mindsparkle Mag has 200k monthly views and a fairly loyal fanbase – Engage them with the unique story and project of your business. Our readers will never miss a post. Through publishing unique content of your brand or studio, we help your website appear at the top of search results. With our expertise, your website can get found—by more people, more often. Let all your projects get the full social media attention they deserve. We promote your content simultaneously across Instagram, Facebook, Twitter, Pinterest and Designspiration. Reach more than 150k followers with an eye for high quality design. Get a dedicated Highlighted Instastory spotlight with all of your projects and unique content. Add links to your website, social account and link to your newsletter signup, we will make you visible directly at the top of our Instagram page with 100k followers. Being part of our ambassador program will guarantee you a visible spot at the bottom on each and every page on Mindsparkle Mag with your logo, link and description. SOON to come: Receive a dedicate profile page on Mindsparkle Mag with selected work, description, links to your social profiles and email-list sign-up. 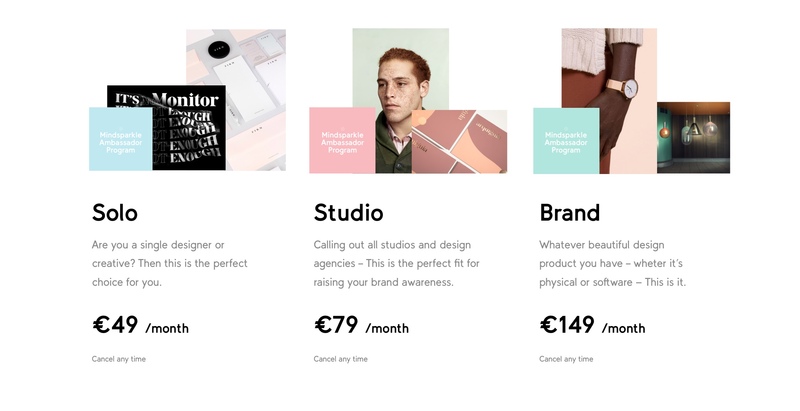 Whether you are a solo designer, a design studio or designer brand, - we got you covered. Sign up for the Mindsparkle Mag Ambassador program with a full 360° service on a monthly basis. Cancel anytime. Please note that we remain the right to approve or decline applications in order to maintain a high quality bar or for limited availability reasons. Thank you for your understanding.